"A delicious recipe with a mingling of melt-in-your-mouth flavor!" Whisk together flour, baking powder, and salt in a bowl. Cut in shortening with a knife or pastry blender until the mixture resembles coarse crumbs. Stir Cheddar cheese and chives into flour mixture; gradually stir in milk to form a soft dough. Turn dough out onto a lightly floured surface and with floured hands, knead until smooth, about 15 times. Roll dough out to a 1-inch thickness with a floured rolling pin. 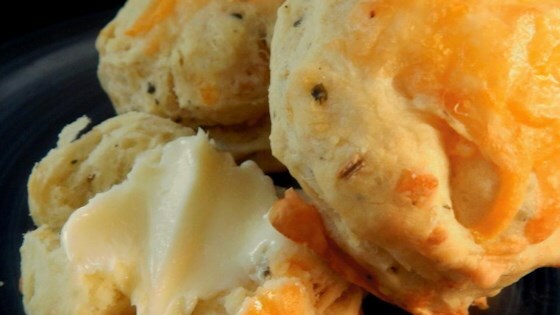 Cut biscuits with a 2 1/2-inch round cookie cutter; place onto an ungreased baking sheet. Press dough trimmings together, roll out again, and cut remaining dough into rounds. Watch how to make this quick tea time treat. I made half the recipe and these were delicious! I will make again. I made these for my boyfriend and now he asks me to make them all the time. Great recipe and a nice addition to any meal. So delicious! Instead of chives (I ran out), I used Club House La Grille Maple Bacon spice, it made them a tad more Canadian too mmmm! Thanks for the recipe!